Artesia has a proud history of having a strong Portuguese community, and this past weekend they were able to celebrate their religious roots in the Festa do Espirito Santo. 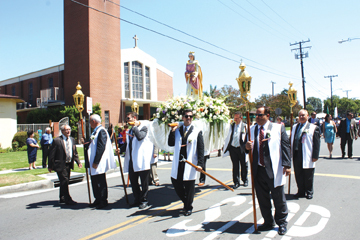 The celebration was held in conjunction with the Artesia D.E.S Hall (Divino Espírito Santo) which was founded in 1927, the year the first Festa was held in Artesia. The entire event is in honor of Lady Fatima and how she went to Portugal and met three children and told them to spread the principles of good character. The event began on Friday by bringing in last year’s “Royal Court” of the festival and introducing the new queen and her two princesses. “It is a huge honor to be crowned as queen or even the two princesses as they are usually of high school age which only lasts for a short period of time. During their time on the royal court, they go around the community doing good and really embodying the principles of good character that were originally taught,” Gabriel Costa a local resident and active member of the Portuguese community. The queen and her princesses typically are chosen by how much time and effort they invest into the DES Hall and helping the community. This year’s Queen was Kaitlyn Sales, and the Princesses were Alexa Corriea, and Alexis Gonsalves. The new court, the celebrations begin with dancing and food in the Hall, allowing for the entire community to come together and begin the festivities that are to follow including the mass, more celebrations, and the “bloodless” bull fight that took place on Monday. Costa, who is a senior at Cerritos High School, described the event as having its roots in religion, but it is not solely religious.